The mission of the Northern Virginia Baha’i Center is to advance and develop people’s spiritual capacities and to provide a physical infrastructure for worship, education, and service in accordance with the universal principles of the Baha’i Faith. The Center serves the spiritual needs of all people, and since its opening has welcomed all who are seeking unity and peace. Construction of the Center marked a milestone for the Baha’i community of greater Northern Virginia. Its very existence represents more than 20 years of planning, fundraising and prayerful reflection by hundreds of individuals committed to the goal of gracing Northern Virginia with its own regional Baha’i Center. In 1988 the Baha’i community purchased the property on which the Center now stands. Plans to build a religious center were formalized in 2002, when the Spiritual Assembly of the Baha’is of Loudoun County, the Trustee of the Center, commissioned Hossein Amanat, a world renowned architect to develop a design. Mr. Amanat, a Baha’i, is the founder-director of Arc International Architecture, of Canada. His magnificent buildings and other structures can be seen around the world, most especially the buildings surrounding the gardens at the Baha’i World Center in Haifa, Israel. The Northern Virginia Baha’i Center has approximately 18,000 square feet on three floors. Its interior contains a 400-seat auditorium, bookstore, library, information center, kitchen, a café, meeting rooms and classrooms, a children’s playroom and a youth activities room. In addition to serving the needs of Loudoun County residents, the Center serves as a hub for the community at large. 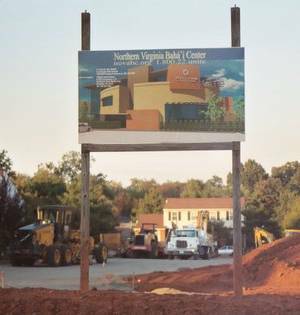 On Friday May 27, 2005 a ceremony was held to officially mark the commencement of construction of the Northern Virginia Bahá’í Center, located on the corner of Route 7 and Cardinal Glen in Sterling, Virginia. This Bahá’í Center will serve the spiritual needs of all people, regardless of their religion, color, or creed. Therefore, the doors of this Bahá’í Center will always be open to everyone who believes in unity and peace. This project is more than 20 years in the making, so the commencement of the Bahá’í Center’s construction is truly a historic event, both for the Bahá’í community and the greater Northern Virginia community. Its purpose is to be a beacon of unity that will touch the hearts of all the inhabitants in the region. The Bahá´í community purchased this property in 1988. However plans to build a religious center was not formulated until 2002 when the Spiritual Assembly of the Bahá´ís of Loudoun County, the Trustee of this Project, commissioned Mr. Hossein Amanat, a world renowned architect to develop a design for this Bahá´í Center. Mr. Amanat is a member of the Bahá´í Faith and the founder-director of Arc International Architecture firm in Canada. Among Mr. Amanat’s achievements are buildings surrounding the magnificent Bahá´í Gardens at the Bahá´í World Center in Haifa, Israel. library, an information center, Kitchen facility, meeting rooms and classrooms, a children’s playroom and a youth activities room. Building construction, which begins in May 2006, and is projected to be completed in 14 months. for the Bahá´í community at large and will provide a permanent home for a community based development initiative; One World Sunday School which now offers a Children Theatre Company. The Children’s Theatre Company is dedicated to Building Character Onstage. While experiencing an exhilarating introduction to the incomparable magic of theatre, children develop a keen sense of citizenship alongside their artistic achievements. CTC promotes theater as a tool for active and analytical learning (rather than prescribed and passive), combining collaborative performances alongside professional artists with an innovative character and ethical education curriculum that emphasizes a culture of inclusivity and service through arts. Children’s Theatre is theatre by kids for grown-ups — fostering in young performers a profound conviction that they are the voices of positive change in society. The Bahá´ís in the region have been embracing this project. There is a sense of pride and ownership, as only members of the Bahá’í community can contribute financially to Bahá’í initiatives such as this one. Projects like this don’t just happen overnight and because someone makes a large donation. Day by day, step by step, there is a transformation in the life and attitudes of the members. Through sacrificial contributions of individuals, young and old, and their families they create a physical manifestation of a spiritual reality; the Unity of Mankind.